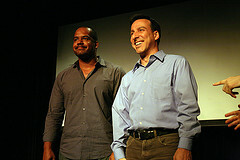 Dave Jadico & Thomas Fowler perform an improv show as you sit in front of them and watch. Performing: Sunday, June 10th, 8:00 p.m.
Jadico Fowler is a the culmination of countless two-man concoctions of previous LunchLady Doris/ComedySportz Philly performers Thomas Fowler and Dave Jadico. With over 36 years of improv experience between them, the two actors have a knack for creating a small cities population-worth of characters, a physical reality that is unavoidable, and has a tendency toward the silent. Dave Jadico is a Barrymore Award winning actor who had performed with the long form group LunchLady Doris for thirteen years, and is currently performing with CSz Philly and has been for the past 18 years, where he is also the Artistic Director. Thomas Fowler has been improvising for over 18 years in Philadelphia and Los Angeles. He was a member of ComedySportz Philly for six years, has performed in LunchLady Doris in Philly, at UCB Los Angeles, Second City Los Angeles, and IO West. He currently performs at IO West in the Armando show and God Squad. He does commercials on the T.V.